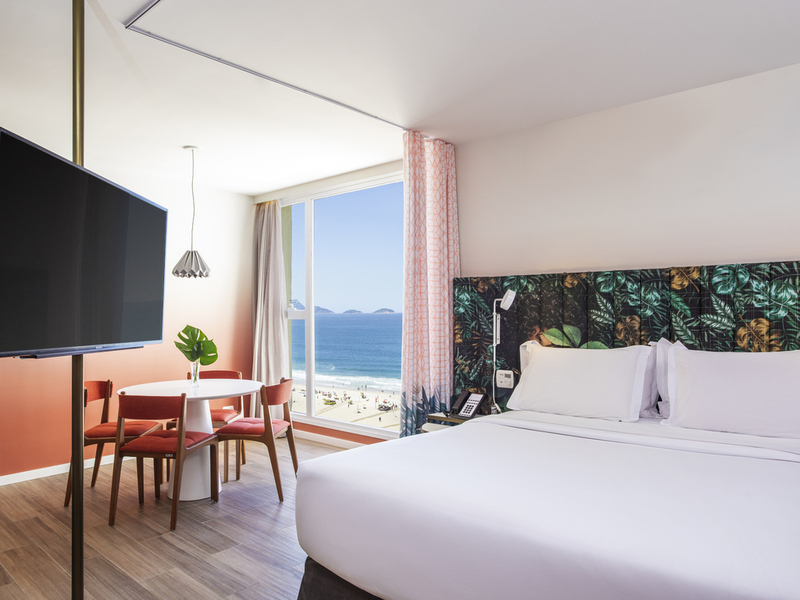 Stay at the Mercure Rio de Janeiro Copacabana hotel, opposite Posto 4 of Copacabana Beach and near to the main tourist attractions in Rio de Janeiro. Relax in comfortable apartments with free WIFI, air conditioning, cable TV, safe and hair dryer. Want to enjoy the beach? You can loan towels and parasols from the hotel. Enjoy a delicious breakfast and all of the facilities with a concierge service, business center, fitness center, sauna and a meeting room for up to 8 people. Floors 11 and 12 are currently undergoing renovation, which may cause noise on nearby floors during business hours. The restaurant has two dining areas: a charming outdoor terrace overlooking the Copacabana beach boardwalk, and a welcoming and tastefully decorated indoor space. Enjoy the relaxed atmosphere of our bar, ideal for meeting up with friends or relaxing later in the evening.